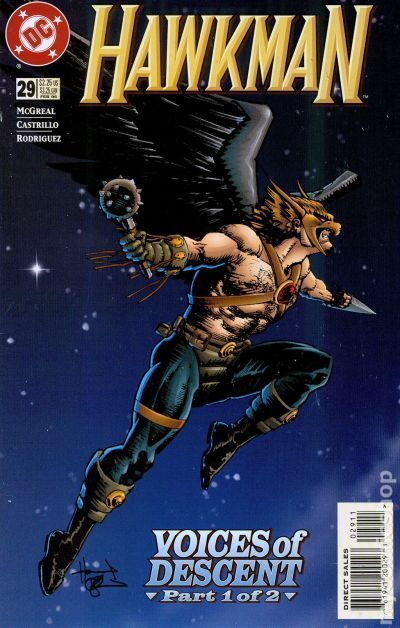 Hawkman is back with a new costume, new weapons, new powers...all in the debut of his action-packed new title! Hawkman's become a true bird of prey...a hard-edged urban hero whose extreme measures won't long escape the notice of the Justice League. The new HAWKMAN series is packed with shocking revelations and new twists...and some of the boldest super-hero action to be found anywhere. And Hawkman is now fully integrated into the DC Universe, with Green Lantern Hal Jordan guest-starring in the first story arc. Script by John Ostrander, with art by Jan Duursema and Rick Magyar. Gold foil-embossed cover by Duursema. New Format. Cover price $2.50. 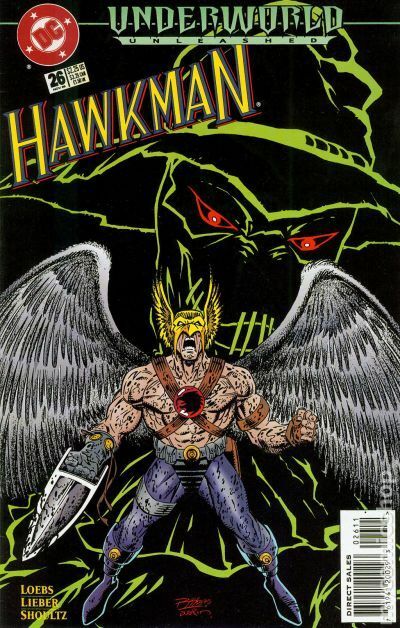 Tracking down the man who hired Deadline to attack the Netherworld, Hawkman finds himself challenged by Green Lantern, who's out to learn just who this latest incarnation of Hawkman really is, leading to a three-way battle with Meta-Tech and its battle-armored agent, Marauder. Script by John Ostrander, with art by Jan Duursema and Rick Magyar. Cover by Duursema. New Format. Cover price $1.75. 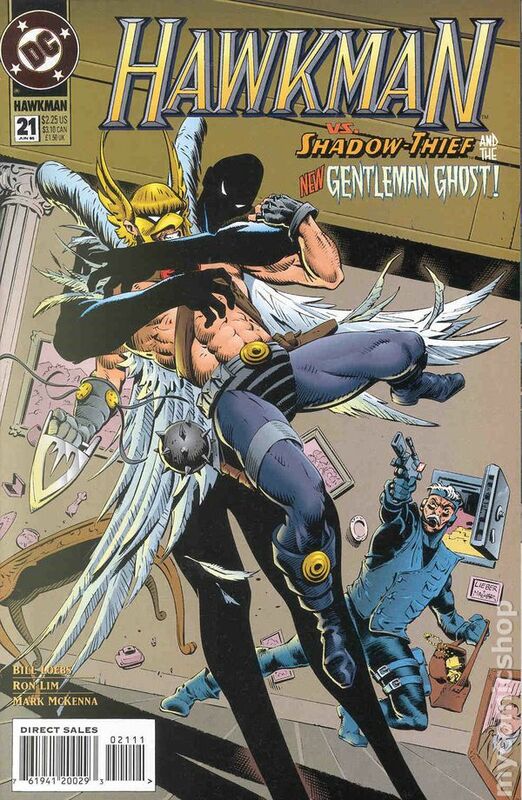 A raid on a Meta-Tech testing site may be the only way Hawkman is able to learn the fate of Hawkwoman. 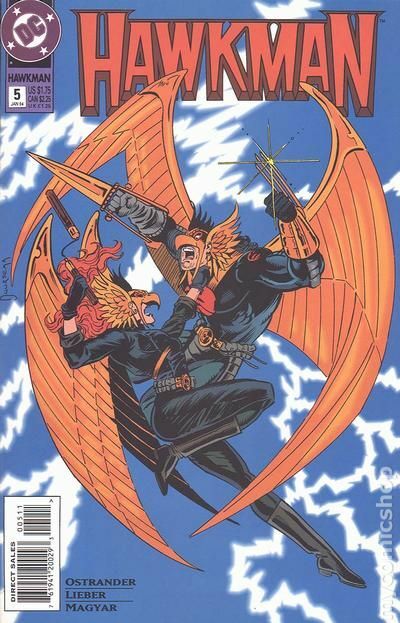 But to learn the shocking truth about Hawkwoman, he must first go through Airstryke...and Count Viper! 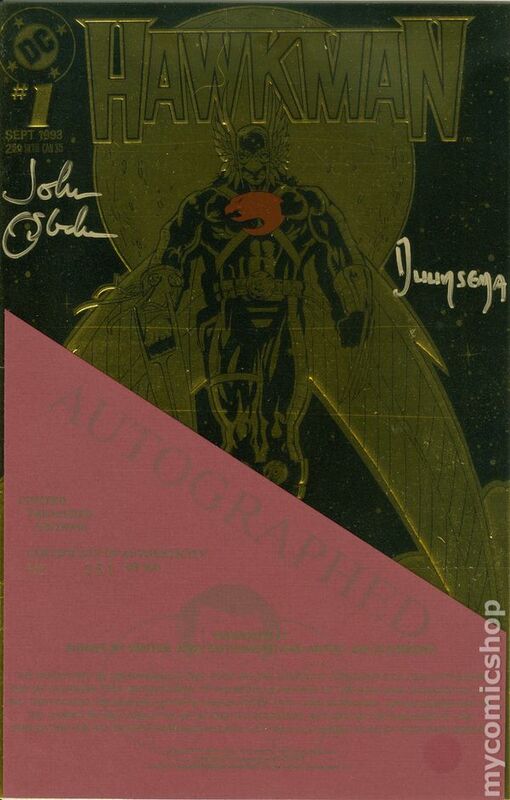 Script by John Ostrander, with art by Jan Duursema and Rick Magyar. Cover by Duursema. New Format. Cover price $1.75. Wonder Woman guest-stars! 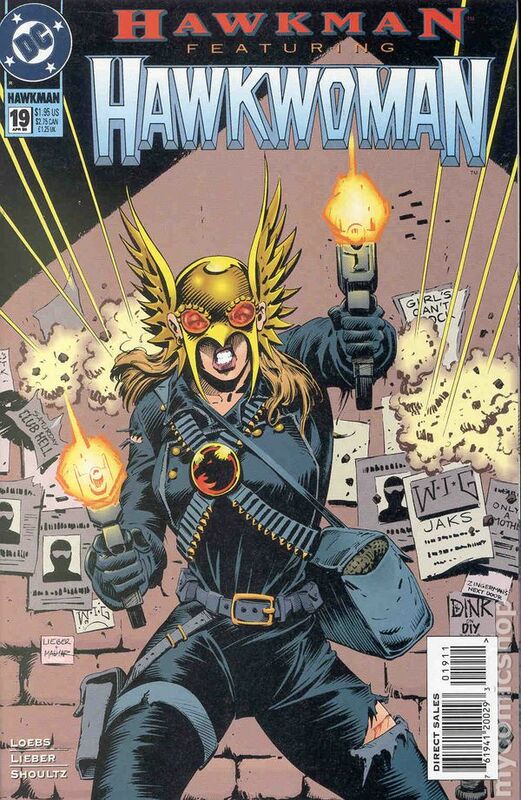 Trapped in Hawkwoman's body, Hawkman is helpless as Count Viper - having usurped Katar Hol's own body - launches his plan to remake the United States. And his starting point is to take over the minds of Justice League heroes to destroy the man whose body he possesses. Script by John Ostrander, with art by Jan Duursema and Rick Magyar. Cover by Duursema. New Format. Cover price $1.75. 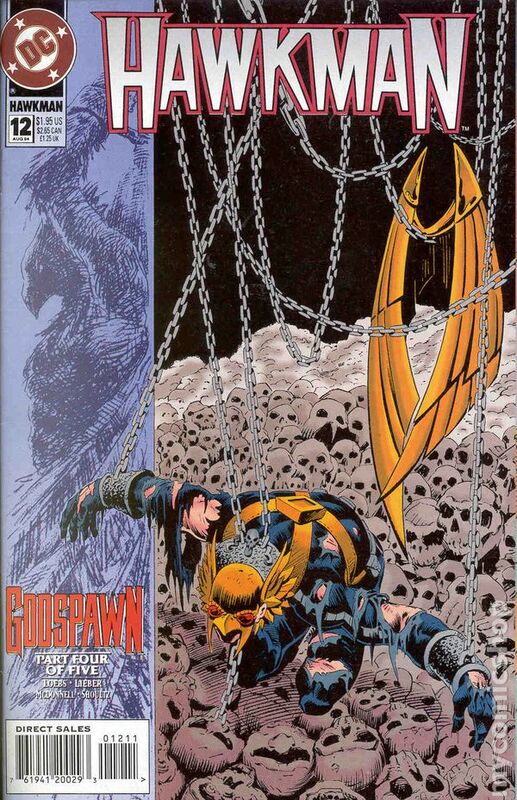 While Hawkman is trapped in the body of Hawkwoman, Hawkwoman is imprisoned in the body of an aging asylum inmate. And it's under those conditions that the pair must face Wonder Woman and Bloodwynd, both under the control of the man who usurped Hawkman's body - the deadly Count Viper. Script by John Ostrander, with art by Steve Lieber and Rick Magyar. Cover by Jan Duursema. New Format. Cover price $1.75. 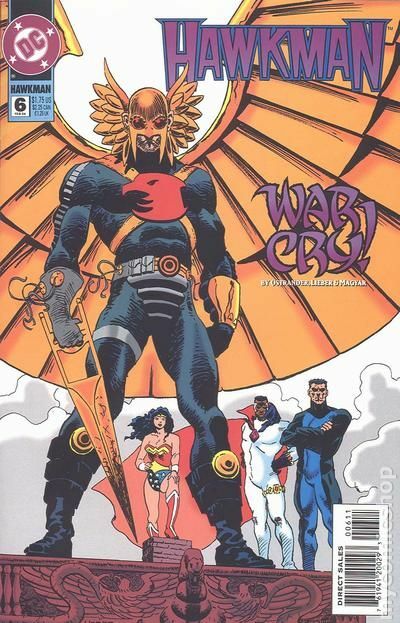 The Eradicator from 'Reign of the Supermen,' along with Wonder Woman and Bloodwynd, guest-star as members of the Justice League join the fight against the enhanced forces of Meta-Tech. 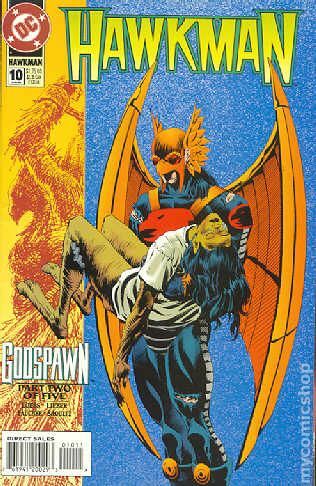 Meanwhile, Hawkman and Hawkwoman take the battle to the spirit plane in an effort to return to their own bodies and bring an end to Count Viper. Plus, revelations about Hawkman's new powers...and the truth about his never-before-seen mother! Script by John Ostrander, with art by Steve Lieber and Rick Magyar. New Format. Cover price $1.75. Part 1 of the 2-part "King of the Netherworld." 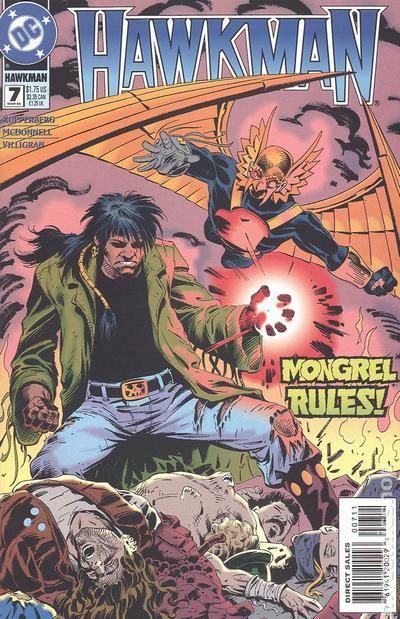 Mongrel, the rebellious New Blood character from Hawkman (1993) Annual #1, takes over the refuge for disaffected metahumans known as the Netherworld. 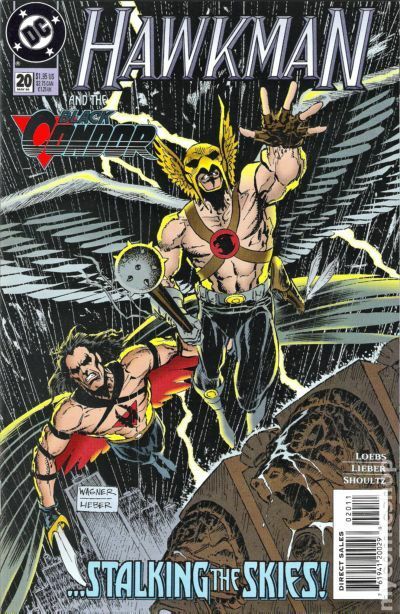 Mongrel is determined to carve a place for himself in a world that has rejected him, even if it means tackling the Netherworld's former champion, Hawkman. Written by Paul Kupperberg, with art by Luke McDonnell and Ricardo Villagran. Cover pencils by Steve Lieber. New Format. Cover price $1.75. Part 2 of the 2-part "King of the Netherworld." Mongrel, shaken by the accidental death of Mustang Suzy, continues his iron-handed lordship over Chicago's outcast metahumans. Hawkman is forced into a no-holds-barred battle with this New Blood character to prevent further deaths...and avert an all-out war. Written by Paul Kupperberg, with art by Luke McDonnell and Ricardo Villagran. Cover by Steve Lieber. New Format. Cover price $1.75. Part 1 of the 5-part 'Godspawn.' 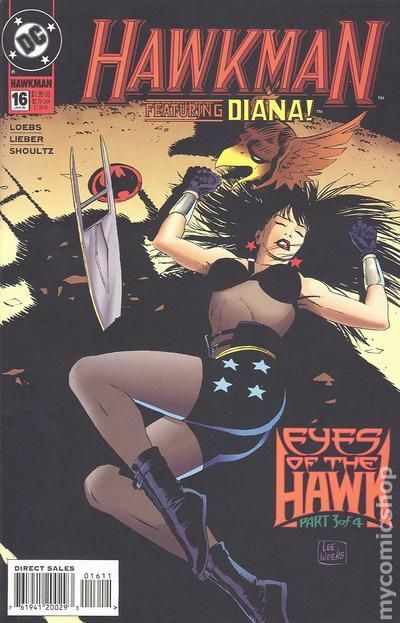 While Hawkman battles the metahuman survivors of Chicago's Netherworld, Katar Hol's mother sends an angry and puzzled Hawkwoman away for some cryptic reason. Meanwhile, the countdown to ZERO HOUR begins for Hawkman and Hawkwoman as, far from Earth, and ominous and destructive figure moves on a collision course for the Hawkworld Thanagar. Written by William Messner-Loebs, with art by Steve Lieber, Mike DeCarlo, Andrew Pepoy and Denis Rodier. Cover by Lieber. New Format. Cover price $1.75. Part 2 of the 5-part 'Godspawn.' 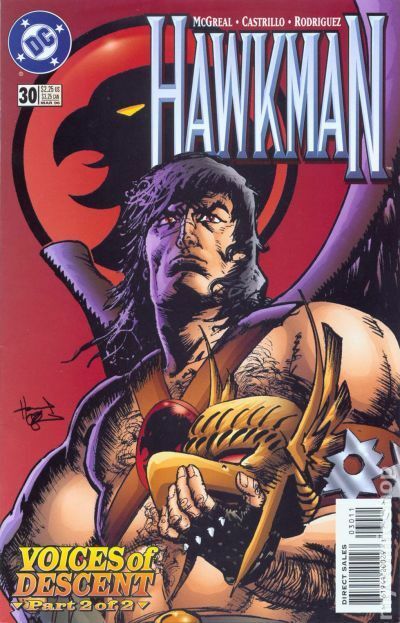 For the life of Feralyce, Hawkman battles Bad Blood, a rampaging metahuman whose blood burns like acid. The struggle becomes even more desperate when the hawk entity responsible for the destruction of Thanagar enters the fray. Written by William Messner-Loebs and Steven T. Seagle, with art by Steve Lieber, Wayne Faucher and Curt Shoultz. New Format. Cover price $1.75. Part 3 of the 5-part 'Godspawn.' 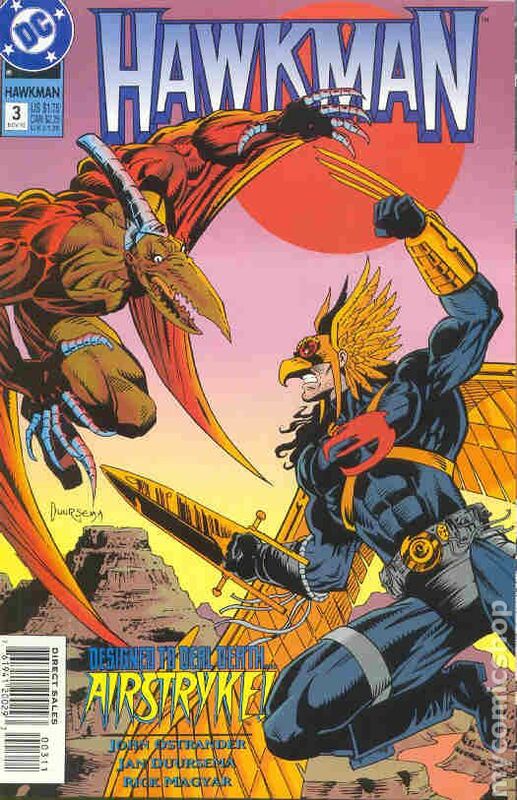 Hawkman meets Hawkman as the Golden Age Hawkman joins Katar Hol's hunt for Bad Blood and his new ally - Mongrel! Meanwhile, the countdown to ZERO HOUR continues as Katar Hol's mother charts the relentless progress of the Hawkgod as it speeds toward Earth...and Hawkman. Written by William Messner-Loebs and Steven T. Seagle, with art by Steve Lieber, Jason Minor and Curt Shoultz. Cover by Lieber and Rick Magyar. New Format. Cover price $1.75. Part 4 of the 5-part 'Godspawn.' The countdown to ZERO HOUR continues as the origins of the malevolent Hawkgod are revealed. 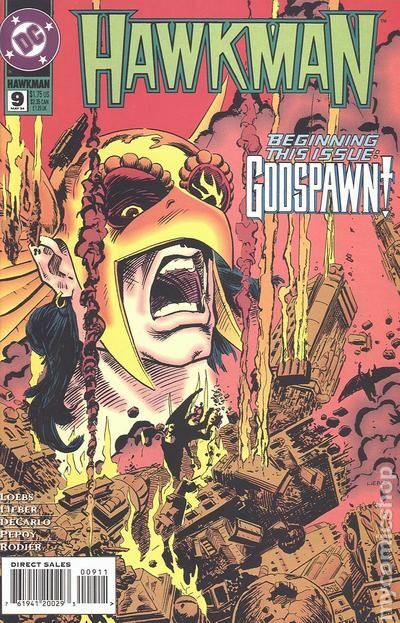 When the Golden Age Hawkgirl becomes the Hawkgod's next human host, Hawkman must choose between letting the Hawkgod go unopposed, or fighting it at the cost of Hawkgirl's life. Written by William Messner-Loebs, with art by Steve Lieber, Luke McDonnell and Curt Shoultz. New Format. Cover price $1.95. Part 1 of the 4-part 'Eyes of the Hawk.' 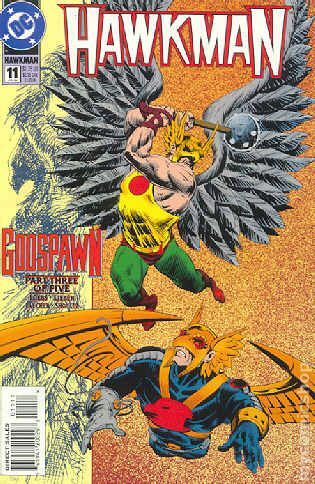 As Hawkman adjusts to the new abilities he acquired during the events of ZERO HOUR, he becomes embroiled in a war that has been waged secretly for centuries. His first adversary from this conflict is a being whose powers and experience far outmatch his own...but may stem from the same otherworldly dimension! Written by William Messner-Loebs, with art by Steve Lieber and Curt Shoultz. Cover by Lee Weeks. New Format. Cover price $1.95. Part 2 of the 4-part 'Eyes of the Hawk.' 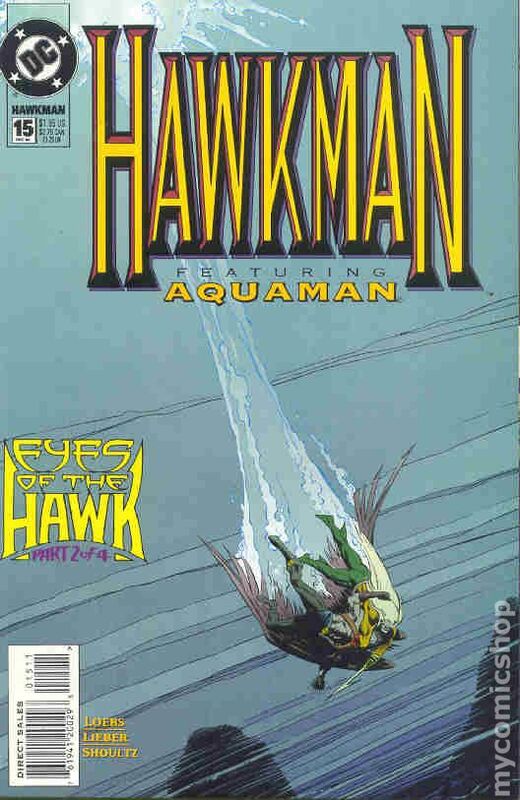 Aquaman guest-stars as, drawn unwillingly into an ancient and mysterious war, Hawkman's quest for answers leads him to an adversary who has recruited a special defender - DC's King of the Seas. A historic battle ensues when these heroes are forced into a fight to the finish. Written by William Messner-Loebs, with art by Steve Lieber and Curt Shoultz. Cover by Lee Weeks and Mike Sellers. New Format. Cover price $1.95. Part 3 of the 4-part 'Eyes of the Hawk.' Guest-starring Diana, the former Wonder Woman! 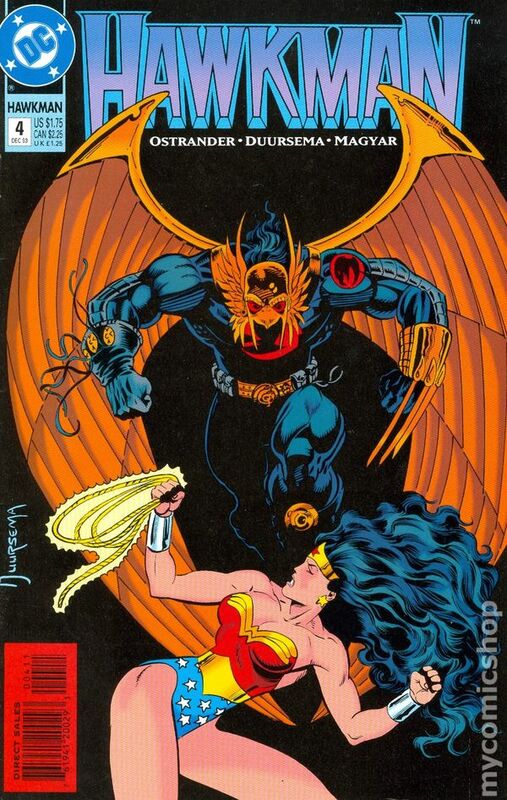 Hawkman's mysterious new foes pursue him to the Grecian islands where he and Diana face an opponent whose powers seem to be derived from the ancient past...and whose strength may outmatch both the Winged Warrior and the amazing Amazon! 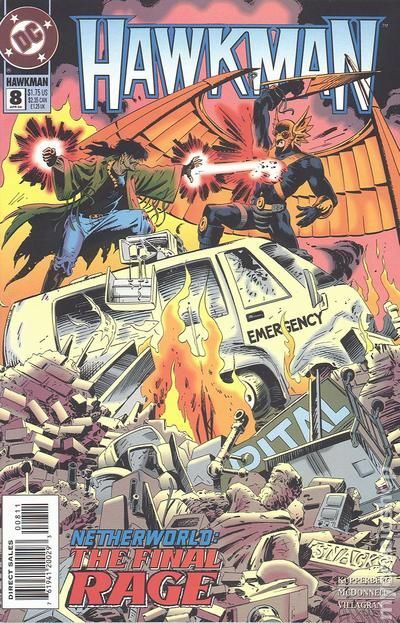 Hawkman guest-stars in this month's Deathstroke the Terminator (1991) #43. Written by William Messner-Loebs, with art by Steve Lieber and Curt Shoultz. Cover by Lee Weeks. New Format. Cover price $1.95. Part 4 of the 4-part 'Eyes of the Hawk.' 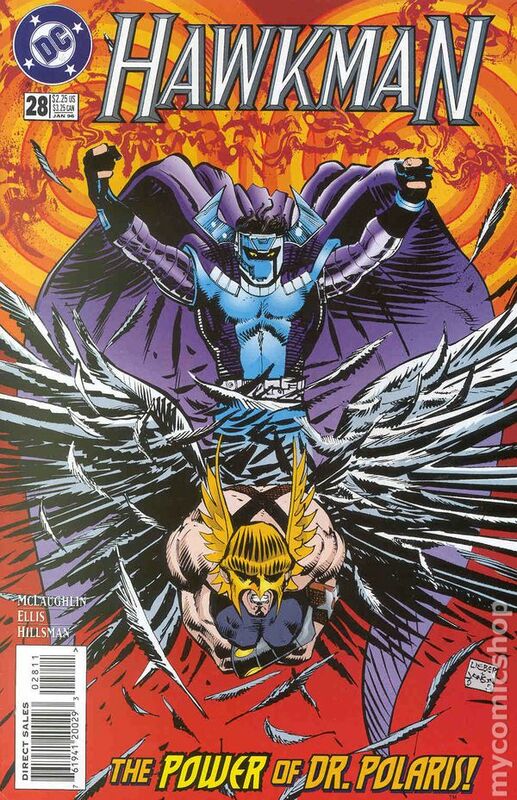 An old foe with powers that rival Hawkman's returns, determined to destroy the Winged Warrior! 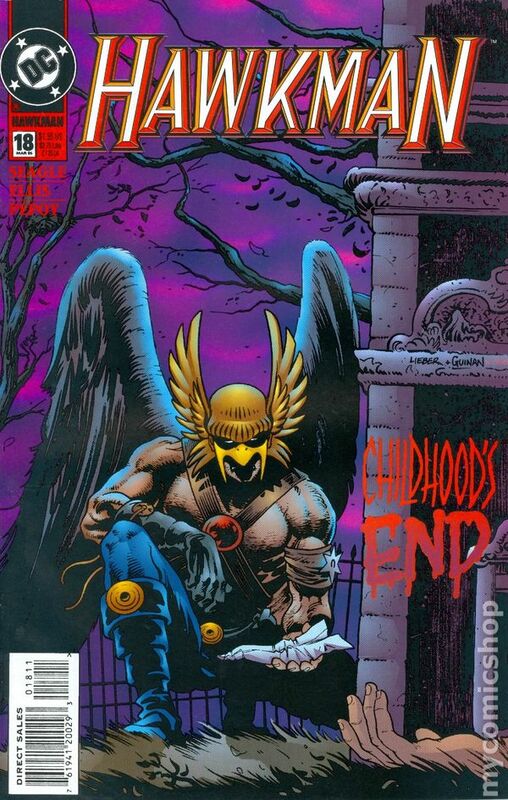 But this villain has something to reveal to Katar Hol: the final secret of Hawkman's rebirth. Written by William Messner-Loebs, with art by Steve Lieber and Curt Shoultz. Cover by Lee Weeks and Mike Sellers. New Format. Cover price $1.95. 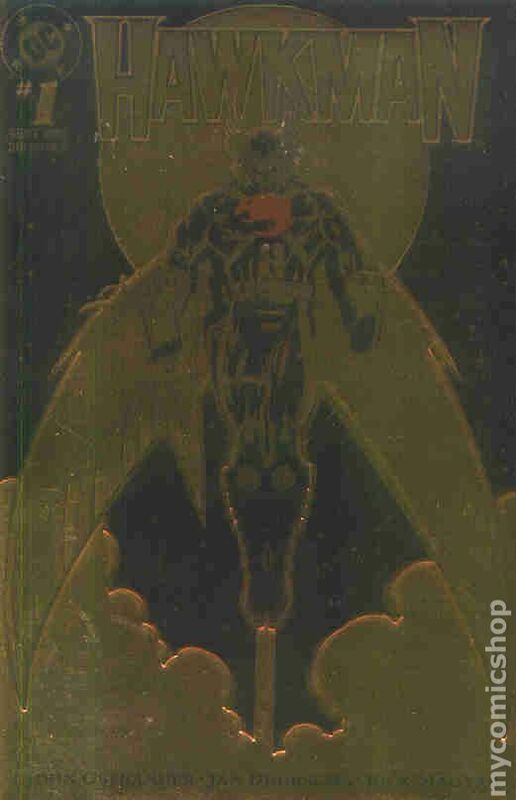 Hawkman discovers a series of brutal murders that may have been committed by a menace he believed he'd already vanquished. 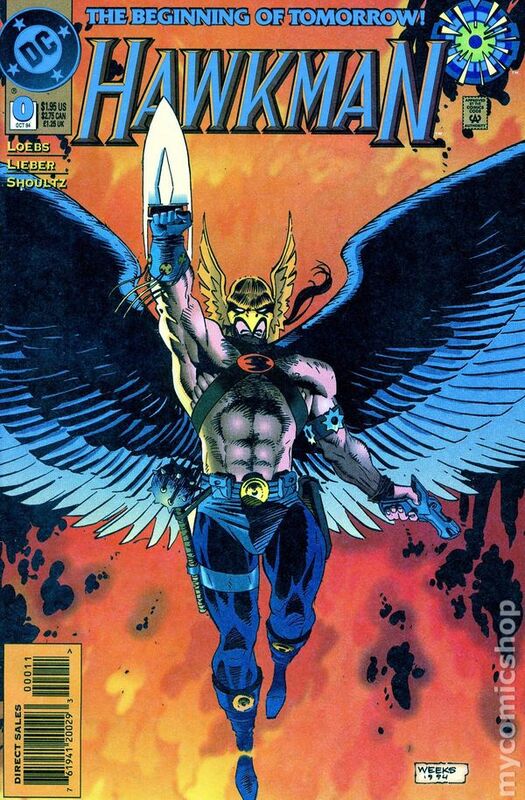 Hawkman also appears in this month's Anima (1994) #12. Written by Steven T. Seagle, with art by Steve Ellis and Andrew Pepoy. Cover by Steve Lieber and Paul Guinan. New Format. Cover price $1.95. Shayera Thal - Hawkwoman - fights to protect her new adopted hometown of Detroit from the fiery fury of 'Devil's Night' and defend herself against the deadly determination of Vigilante. 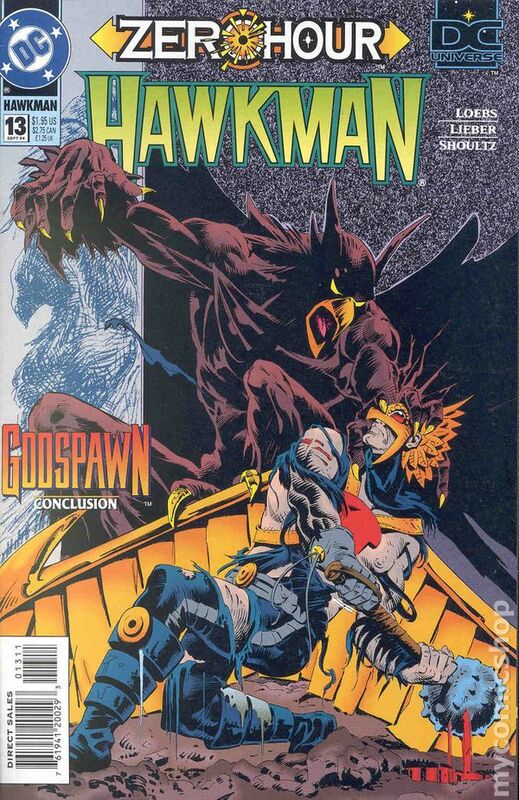 Hawkman appears in this month's Anima (1994) #13. Written by William Messner-Loebs, with art by Steve Lieber and Curt Shoultz. Cover by Lieber and Rick Magyar. New Format. Cover price $1.95. Black Condor guest-stars, seeking Hawkman's help in being a hero. 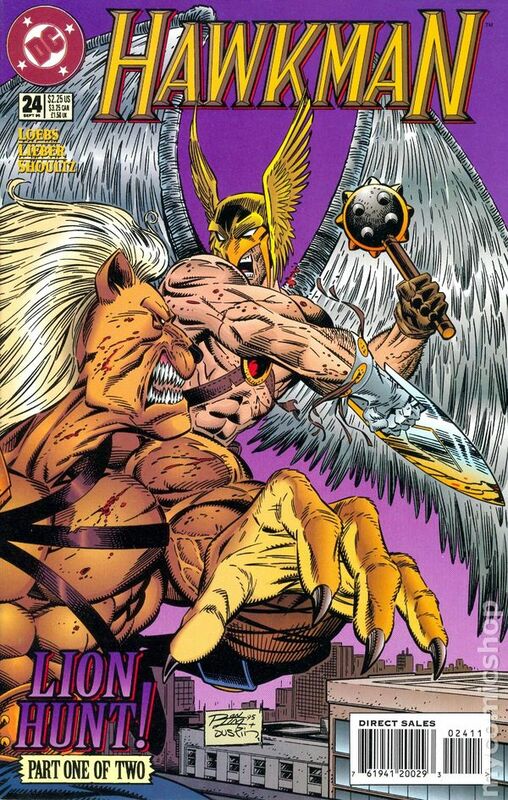 But the winged warriors' roles are reversed as Hawkman needs Black Condor's help in resisting his violent urges. Written by William Messner-Loebs, with art by Steve Lieber and Curt Shoultz. Cover by Lieber and Ron Wagner. New Format. Cover price $1.95. Weaponless at a formal gathering, Katar Hol must rely solely on his wits to stop two dueling gatecrashers: the Shadow Thief and the new Gentleman Ghost. Written by William Messner-Loebs, with art by Ron Lim and Mark McKenna. Cover by Steve Lieber and Rick Magyar. Mando Format. Cover price $2.25. Warrior and the Justice League guest-star in Part 3 of the 7-part crossover story 'The Way of the Warrior,' continued from Justice League America (1987) #101. 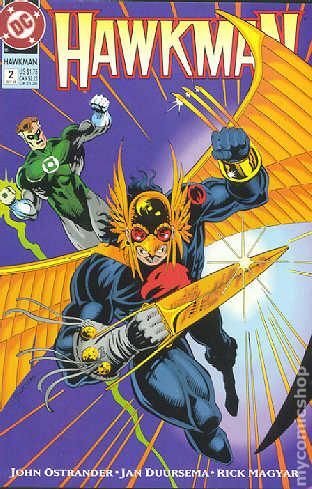 Hawkman, Guy Gardner and the JLA head toward the stars to stop an incoming invasion force. The location of their first encounter: Hawkman's home planet, Thanagar. 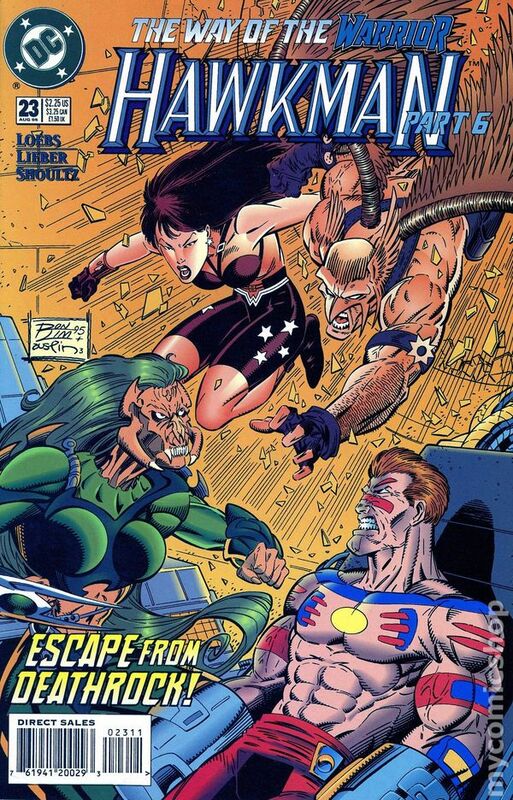 Continues in Guy Gardner Warrior (1992) #33. Written by William Messner-Loebs, with art by Steve Lieber and Curt Shoultz. Cover by Ron Lim and Terry Austin. Mando Format. Cover price $2.25. Part 6 of the 7-part 'The Way of the Warrior,' continued from Justice League America (1987) #102. 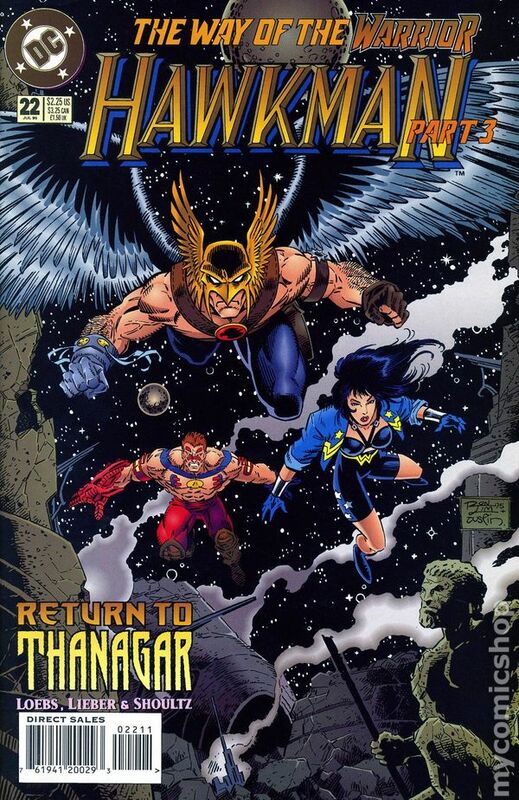 Hawkman leads a strikeforce to the Tormock homeworld to rescue Warrior. Concludes in Guy Gardner Warrior (1992) #34. Written by William Messner-Loebs, with art by Steve Lieber and Curt Shoultz. Cover by Ron Lim and Terry Austin. Mando Format. Cover price $2.25. Part 1 of the 2-part 'Lion Hunt.' 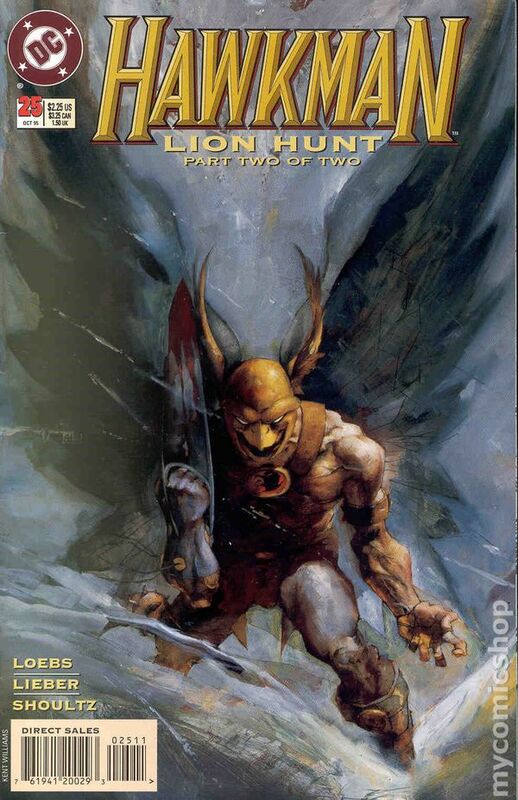 The Winged Warrior is stalked by the savage Lionmane, a deadly avatar whose only goal is to kill Hawkman...for the second time. Written by William Messner-Loebs, with art by Steve Lieber and Curt Shoultz. Cover by Ron Lim and Terry Austin. Mando Format. Cover price $2.25. Part 2 of the 2-part 'Lion Hunt.' 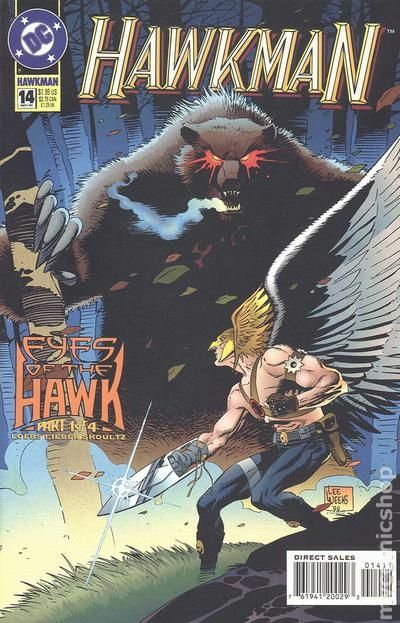 It's a fight to the finish between Hawkman and the savage avatar Lionmane - a vicious killer who murdered one of Hawkman's earlier incarnations. Written by William Messner-Loebs, with art by Steve Lieber and Curt Shoultz. Painted cover by Kent Williams. Mando Format. Cover price $2.25. UNDERWORLD UNLEASHED tie-in. 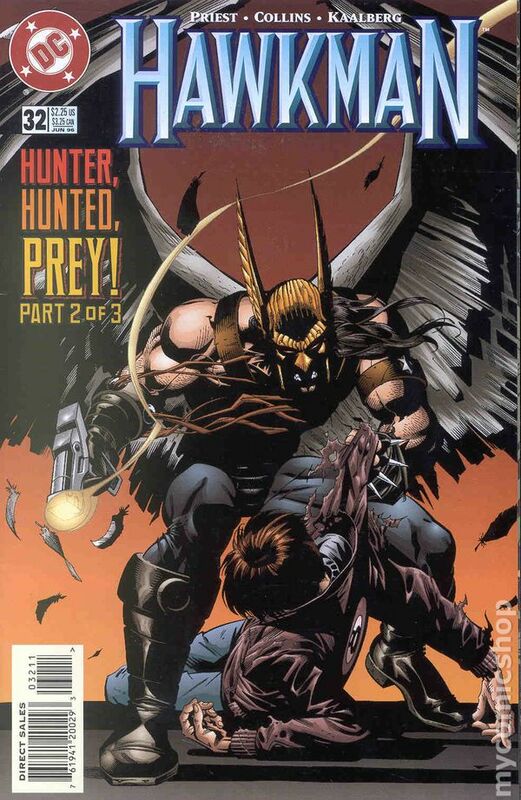 In the midst of the citywide chaos created by Neron, the Scarecrow terrorizes Chicago and pushes an already-unstable Hawkman even further over the edge. Written by William Messner-Loebs, with art by Steve Lieber and Curt Shoultz. Cover by Ron Lim and Terry Austin. Mando Format. Cover price $2.25. Cover pencils by Ron Lim, inks by Terry Austin. 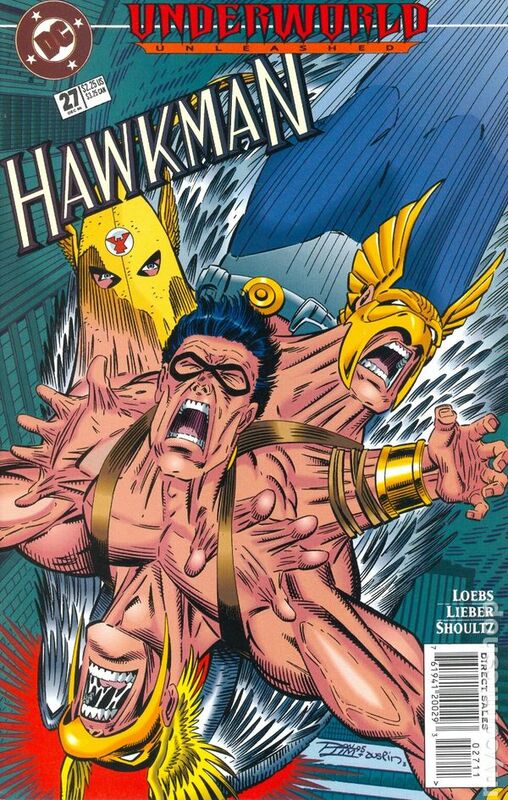 Hawkmad!, script by William Messner-Loebs, pencils by Steve Lieber, inks by Jerry Bingham; Bewildered, confused and on the brink of madness, Hawkman is approached by the force behind the chaos of UNDERWORLD... a man who has a deal that Hawkman may not be able to refuse. 36 pgs. $2.25. Cover price $2.25. Cover pencils by Steve Lieber, inks by Klaus Janson. Free Fall, script by Shaun McLaughlin, pencils by Steve Ellis, inks by Don Hillsman; In an aerial test of wills, Hawkman pits himself against the power of Dr. Polaris with the fate of the First Lady and the crew of Air Force One hanging in the balance. But will Hawkman be able to take down a force that has proven to be more than a match for both the Ray and Green Lantern? 36 pgs. $2.25. Cover price $2.25. Cover art by Howard Chaykin. Voices of Descent, Part 1 of 2, script by Pat McGreal, pencils by Anthony Castrillo, inks by Anibal Rodriguez [as Hanibal Rodriguez]; The souls of the previous incarnations of Hawkman are awake in Katar Hol's head... and if their constant squabbling doesn't drive him mad, their attempts to take control of his body and mind will! 36 pgs. $2.25. Cover price $2.25. Cover art by Howard Chaykin. Voices of Descent, Part 2 of 2, script by Pat McGreal, pencils by Anthony Castrillo, inks by Anibal Rodriguez [as Hanibal Rodriguez]; Unable to resist them any longer, Hawkman surrenders to the souls of the earlier, slain Hawk avatars clamoring in his mind for vengeance. 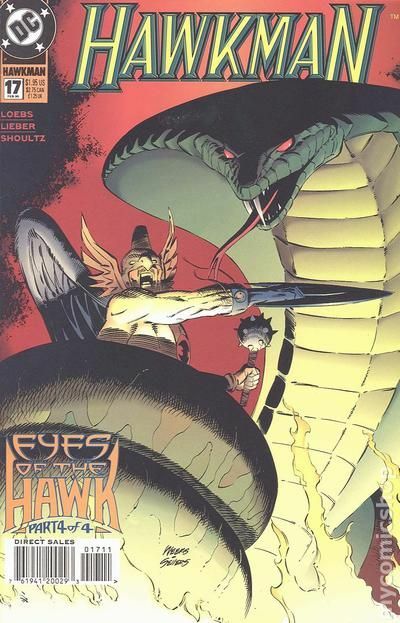 Now the Winged Warrior must set out to defeat the immortal destroyer of Hawkmen, Vandal Savage! 36 pgs. $2.25. Cover price $2.25. Cover pencils by Howard Porter, inks by John Dell. Hunter, script by James Owsley [as Christopher Priest], pencils by Howard Porter, inks by Barbara Kaalberg; Someone is using Thangarian methods to kill drug dealers. 36 pgs. $2.25. Cover price $2.25. Cover art by Howard Porter. 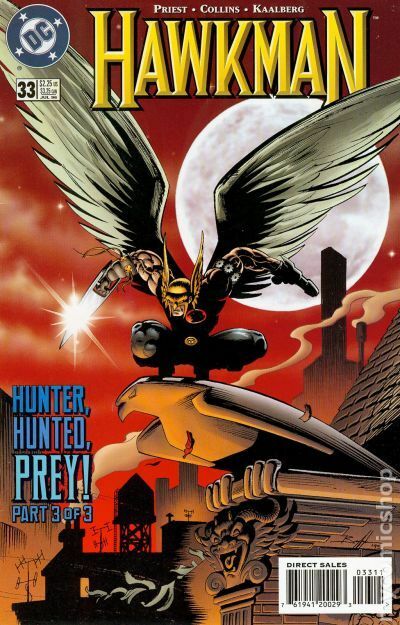 Hunted, script by James Owsley [as Christopher Priest], pencils by Mike Collins, inks by Barbara Kaalberg; Things get rougher for the Winged Warrior as he deals with the Seven Six. Ballot for Comics Buyer's Guide 1996 Fan Awards. 36 pgs. $2.25. Cover price $2.25. Cover art by Norm Breyfogle. 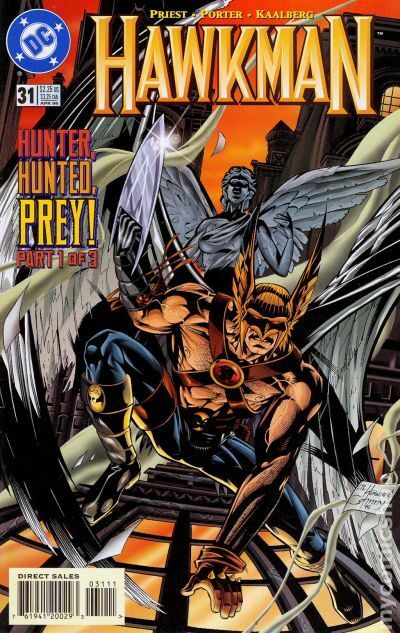 Prey, script by James Owsley [as Christopher Priest], pencils by Mike Collins, inks by Barbara Kaalberg; Hawkman battles for his very soul; Will Arion be able to help him? 36 pgs. $2.25. Cover price $2.25.